This Fat Burner will motivate you with quickly noticeable results! Magnum Heat Accelerated combines 30 fat-incinerating ingredients to support the optimal environment to burn fat. This product will have you firing on all cylinders! Infusing thermogenic agents and natural stimulants, Magnum Heat Accelerated raises the body's core temperature to promote fat loss. 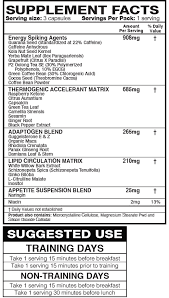 Magnum Heat also contains a blend of Adaptogens to support the body's fat reduction and physical transformation. Adaptogens are anti-oxidants that help support endocrine hormones and may promote immune system function, help the body cope with stress and promote optimal homeostasis. 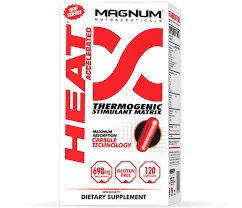 Magnum Heat will help provide the support you need to attain the body you desire. What affects can I expect from taking Heat Accelarated? How does Heat Accelarated differ from other Fat burners? Who can benefit from Heat Accelarated?